OAKLAND, Calif. - They spent months warning the world of the apocalypse, some giving away earthly belongings or draining their bank accounts. And so they waited, eagerly or anxiously, on Saturday for the appointed hour to arrive. When 6 p.m. came and went at various spots around the globe, and nothing extraordinary emerged, Keith Bauer  who hopped in his minivan in Maryland and drove his family 3,000 miles to California for the momentous occasion  tried to take it in stride. "I had some skepticism but I was trying to push the skepticism away because I believe in God," he said in the bright morning sun outside the gated Oakland headquarters of Family Radio International, whose founder, Harold Camping, has been broadcasting the apocalyptic prediction for months. "I was hoping for it because I think heaven would be a lot better than this earth." But he added, "It's God who leads you, not Harold Camping." Bauer, a tractor-trailer driver, took off for California last week, figuring that if he "worked last week, I wouldn't have gotten paid anyway, if the Rapture did happen." He plans to hop back in his minivan and begin the cross-country drive back Sunday with his wife, young son and another family relative. 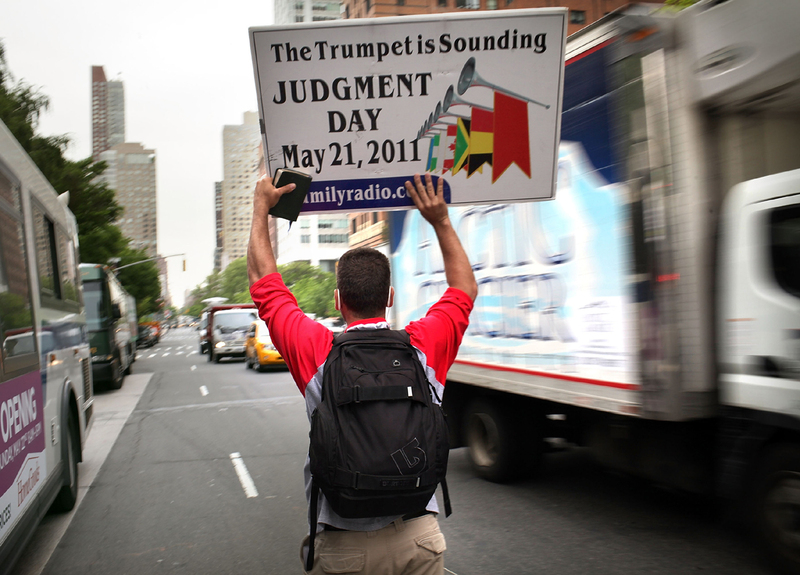 The May 21 doomsday message was sent far and wide via broadcasts and web sites by Camping, an 89-year-old retired civil engineer who has built a multi-million-dollar nonprofit ministry based on his apocalyptic prediction. According to Camping, the destruction was to have begun its worldwide march as it became 6 p.m. in the various time zones, beginning in New Zealand. The Internet was alive with reaction in the hours past 6 p.m. Saturday in New Zealand. "Harold Camping's 21st May Doomsday prediction fails; No earthquake in New Zealand," read one posting on Twitter. "If this whole end-of-the-world thingy is still going on ... it's already past 6.00 in New Zealand and the world hasn't ended," said another. At Chicago's Millennium Park, hours before that time arrived locally, people continued to take photographs of the famed Cloud Gate as they do every other Saturday  and many saw the prediction about Judgment Day as something of a joke. "I guess the whole school thing was a waste of time," said Sarah Eaton, a 19-year-old college student visiting the city from St. Paul, Minnesota. Mena Bishara, 24 of Houston, said if he did believe it he sure wouldn't be walking around the park with his sister. "Skydiving," he said. "Or I'd buy a motorcycle." The Internet also was alive with discussion, humorous or not, about the end of the world and its failure to occur on cue. Many tweets declared Camping's prediction a dud or shared, tongue-in-cheek, their relief at not having to do weekend chores, pay their bills or take a shower. The top trends on Twitter at midday included, at No. 1, "endofworldconfessions," followed by "myraptureplaylist." Camping's radio stations, TV channels, satellite broadcasts and website are controlled from a humble building sandwiched between an auto shop and a palm reader's business. Family Radio International's message has been broadcast in 61 languages. He has said that his earlier apocalyptic prediction in 1994 didn't come true because of a mathematical error. "I'm not embarrassed about it. It was just the fact that it was premature," he told The Associated Press last month. But this time, he said, "there is...no possibility that it will not happen." Camping and his followers believe the beginning of the end will come on May 21, exactly 7,000 years since the flood in the biblical story of Noah's Ark. Camping believed that some 200 million people would be saved, and that those left behind would die in earthquakes, plagues, and other calamities until Earth is consumed by a fireball on Oct. 21. So how much would Doomsday cost? Christian leaders from across the spectrum widely dismissed the prophecy. One local church was concerned that Camping's followers could slip into a deep depression come Sunday. Pastor Jacob Denys of Milpitas-based Calvary Bible Church planned to wait outside the nonprofit's headquarters on Saturday afternoon, hoping to counsel believers who may be disillusioned if the Rapture does not occur. "The cold, hard reality is going to hit them that they did this, and it was false and they basically emptied out everything to follow a false teacher," he said. "We're not all about doom and gloom. Our message is a message of salvation and of hope." As the day drew nearer, followers reported that donations grew, allowing Family Radio to spend millions on more than 5,000 billboards and 20 recreational vehicles plastered with the doomsday message. In 2009, the nonprofit reported in IRS filings that it received $18.3 million in donations, and had assets of more than $104 million, including $34 million in stocks or other publicly traded securities. In the Philippines, a big billboard of Family Radio ministry in Manila warned of Judgment Day. Earlier this month, group members there distributed leaflets to motorists and carried placards warning of the end of the world. Marie Exley, who helped put up apocalypse-themed billboards in Israel, Jordan and Lebanon, said the money helped the nonprofit save as many souls as possible. She said she and her husband, mother and brother were glued to the television on Friday night waiting for news of an earthquake in the southern hemisphere. When that did not happen, she said fellow believers began reaching out to reassure each other of their faith in the prophecy. "Some people were saying it was going to be an earthquake at that specific time in New Zealand and be a rolling judgment, but God is keeping us in our place and saying you may know the day but you don't know the hour," she said Saturday, speaking from Bozeman, Montana. "The day is not over, it's just the morning, and we have to endure until the end." Camping, who lives a few miles from his radio station, was not home Saturday at midmorning. But Sheila Doan, 65, Camping's next-door-neighbor of 40 years, was. She said the worldwide spotlight on the prediction is far more attention than Camping's 1994 prediction got. Doan said she is a Christian but that she doesn't buy into his views and is not among his followers. "I wouldn't consider Mr. Camping a close friend and wouldn't have him over for dinner or anything, but if he needs anything, we're there for him," Doan said.